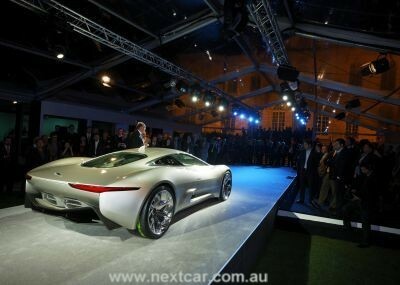 Jaguar has revealed a stunning range-extended electric super car concept car. The C-X75 has been designed to celebrate 75 years of the marque and provide a glimpse into the future of Jaguar and its commitment to producing beautiful, fast cars powered by sustainable means. “The C-X75 is a tribute to the people who shaped the iconic Jaguars that are revered to this day. By making it an innovative test-bed for the technologies of tomorrow, it also ensures that our reputation for engineering excellence will continue for another 75 years and beyond.” said Mike O’Driscoll, Managing Director, Jaguar Cars. The C-X75 is finished in Jetstream Silver, its designers staying true to the long-held Jaguar design philosophy of natural, flowing lines and simple, elegant forms. Where inspiration from the past was found is in the innovative engineering and functional design elements of cars like the 1950s C-Type and D-Type racers and unique 1966 XJ13 Le Mans prototype – a car described by Callum as, “arguably the most beautiful Jaguar ever made”. Shorter and lower than the current crop of super cars, its exterior design is about pure performance with a simple central fuselage surrounded by prominent wheel arches. Thanks to the packaging efficiencies provided by the absence of a conventional piston engine, the car’s designers had maximum freedom in placing the mechanical components and making the most elegant engineering package available. “The C-X75 is everything a Jaguar should be. It possesses remarkable poise and grace yet at the same time has the excitement and potency of a true super car. You could argue this is as close to a pure art form as a concept car can get and we believe it is a worthy homage to 75 years of iconic Jaguar design.” said Ian Callum, Design Director, Jaguar Cars. The 330 km/h (205 mph) four-wheel drive super car is capable of running in purely electric (zero tailpipe emissions) mode for 110 km (68 miles) on a six-hour domestic plug-in charge. The innovative, lightweight micro gas-turbines are also capable of very quickly and efficiently recharging the Lithium-ion batteries, giving the car a theoretical range of 900 km (560 miles). This remarkable range-extension system is a result of Jaguar’s research engineers adopting a clean-sheet approach to the question of powering the super cars of the future. The C-X75 turns to the very latest evolution of a pioneering British technology: the gas turbine. Developed in partnership with Bladon Jets, the miniaturised turbine blade - the first viable axial-flow micro-turbine - increases the compression and efficiency of micro gas-turbines to the point at which they can be viewed as a realistic power source. Each of the micro gas-turbines weighs just 35 kg and produces 70 kW of power at a constant 80,000 rpm. The energy provided by the turbines and stored in the batteries is transmitted to the road using four independent electric motors. Using individual motors has benefits in terms of weight-saving and distribution, packaging and efficiency. Each motor weighs just 50 kg but produces 145 kW (195 bhp) of power and an astonishing combined total torque output of 1,600 Nm (11,80 lb ft). Because each wheel is driven by its own electric motor, the C-X75 is four-wheel drive – with all the traction, grip and safety benefits that entails – without the weight disadvantages of a purely mechanical set-up. Inherent in this drivetrain is the ability to independently vector torque to each wheel across the full speed range. This offers potential benefits in terms of stability and control, providing an infinitely and instantaneously adjustable traction and stability control system. A new interface for the driver has also been made for the C-X75 using high-resolution TFT screens. Building on Jaguar’s 10-year expertise in touchscreen technology, the Jaguar Co-Pilot display in the centre console supports the driver in extracting the full potential of the C-X75 by seamlessly managing information. The main driver information screen is housed within the instrument binnacle. Needles float on the periphery of the twin cowls and sweep round the outer edge to display the status and rpm of the two turbines. The design team combined designs from instrumentation in the new XJ saloon with those from fighter aircraft to provide virtual 3D ‘gimbals’ around which the gauges wrap and rotate to provide status updates. "Performance through innovation has always been a Jaguar trademark. From the beginning, cars such as the C-Type and D-Type pioneered aluminium construction, aerodynamic design, racing monocoques and disc brakes. 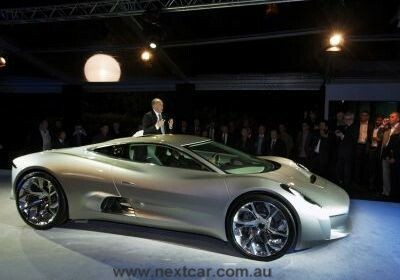 The C-X75 demonstrates that Jaguar is still leading the field automotive design and technology. And will always continue to build beautiful, fast cars." 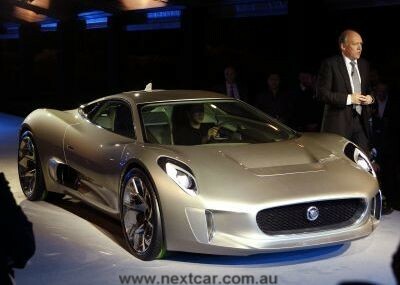 said Ralf Speth, Chief Executive Officer, Jaguar Land Rover. Jaguar’s expertise in the use of aluminium stretches back more than 50 years to the first XK120s, through the lightweight E-Types, the XK and all-new 2010 XJ. It was with this latter model that Jaguar fully realised the lightweight metal’s benefits to performance, agility, economy and sustainability in a luxury car. The Jaguar C-X75 Concept naturally follows the same construction techniques with an extruded and bonded aerospace-inspired aluminium chassis clad in panels of the same material. Not only does this save weight, crucial in a car with an extreme performance envelope, but aluminium is one of the most easily recyclable metals available, boosting the C-X75’s sustainability as well as its speed. Jaguar has increased the design’s aerodynamic efficiency dramatically by opening the front grille and brake cooling vents only when necessary. At the rear corners of the car vertical control surfaces automatically engage at higher speeds to direct airflow aft of the rear wheels for increased stability and efficiency. The carbon-fibre rear diffuser, a crucial element in guiding airflow under the car and providing downforce includes an active aerofoil, which is lowered automatically as speed increases. Vanes in the exhaust ports then alter the directional flow of the gases to further increase the effectiveness of the Venturi tunnel.